After all these Bushmerican years when people with a perverse taste for free speech tried heavily not to press too hard their tongue into the truth (to avoid accusation of helping terrorists), it is of no surprise to find the Obama presidency under the high-tech-weapon verbal attacks (somebody even said to the cheering crowd that Obama must die as a punishment for his attempts at health care reform). Clown Back (Glenn Beck), Crushon Vannity (Sean Hannity) and Crush Bimbo (Rush Limbaugh) have acquired the piloting skills of verbal crawling. One of them announced that he wants to kill Michael Moore but he is not sure he will do the job himself or hire a hit man. Another uttered that most of the liberals ought to be killed, except a couple of them on each college campus as a reminder about the evil “we saved our country from”. Hundreds and hundreds of right wing talk show hosts follow the banner of dirty and darty speech that targets the political opponents and all those who differ from them in their world view. Ultimately, their main target is the human culture as such that for several centuries has tried to induce in people the critical thinking. It is in these circumstances that President Obama became a victim of a hooliganic behavior during a speech to the joint session of American Congress – for the first time in the history of American politics a President was called a liar by a neo-con congressman screaming from the audience. The murderous talk is successful – people without intellectual sophistication and refinement of the soul are happy to identify with the megalomaniacal and scapegoating messages: they want to be somebody, and because for them it means to dominate others – the glorification of their self-image and hate toward the humanistically educated people is for them the real path toward the feeling of being on top. This pleasure that they are ahead of humanistic education itself – that they are smart enough to understand life without taking college courses, makes them fixated on hate talk as a great liberator from social hierarchy. The murderous talk is not just talk. What belongs to human tongue also belongs to the human muscle and fist. The blows follow the insults. Murderous talk is a psychological mobilization for murder, warming up before the criminal act. In Russia, loutish assault speech created a bloody and meaningless revolution. In Germany it created a Nazi transformation of political power into a genocidal one. But in Germany even before Nazification of public opinion it created a number of prestigious political assassinations. The same can easily happen in post-Bushmerican U.S. Words inflame guns. Guns inflame triggers. Triggers release bullets. Flying and killing bullets create an illusion of power in those who need to kill to feel that they exist. Neo-conservative (post-democratic) talk show hosts and extremists among the GOP politicians are not getting tribune for self-expression and social influence through “free market” competition. They are showered with super-money by their mega-global-corporate sponsors who don’t need an educated population. Corporate decision-makers need people prone to react with shouting excitement on slogans of proud self-aggrandizement and glamorous hate. Incredible sums of money, unknown before in show-business and political lobbying, are spent to recruit cheep flattery to trigger joyous self-sacrificial hate of the desperate poor people without civilized channels for self-realization. This money is quite able to create a momentum for mutiny against democracy, like it happened in Germany. By feeding the mass frustration and hate the super-rich make those who are pauperized their happy, poppy and tappy servants. The fascist movements are a sort of welfare rich roaches and crickets provide the poor for the sake of keeping their power intact from “anarchic and unjust ideological criticism”. They agree to provide the poor with social power in a condition that their dominant position will not be challenged (the liberal welfare option instead kept the ideological criticism of the top by the bottom open). Fascism is a system that plays the populist card in a condition that the conservative rich will be recognized as the country’s natural leaders. It smartly contradicts itself – it is something like elite populism, where populist moment is sentimentalized and aggrandized to hide the fact (and to compensate for the fact) that the financial elite is gloriously in charge. It is very close to Soviet Communism (with a difference that the communists were interested more not in financial power but in direct – ideological-police power; they were more vampires, than flesh-greedy cannibals). We see empty mouths screaming menaces and condemnations, empty eyes that see nothing, too much dangerous physical acting-out, and we hear a lot of noise, exactly like we hear today from the right wing indiscriminate propagandists. Ernst depicts aggression – the barbarity, primitivism of feeling and intellectual primordiality (retardation) as a function of losing the psychological balance and the existential proportion, as becoming an appendix to our (aggressive) impulses. In the painting not only particular monstrous creatures are disbalanced and maniacal – the behavior of their very group is obsessive and chaotic: exactly as we observe it in the monstrous passions of neo-conservative extremist agitators of hate and murder. 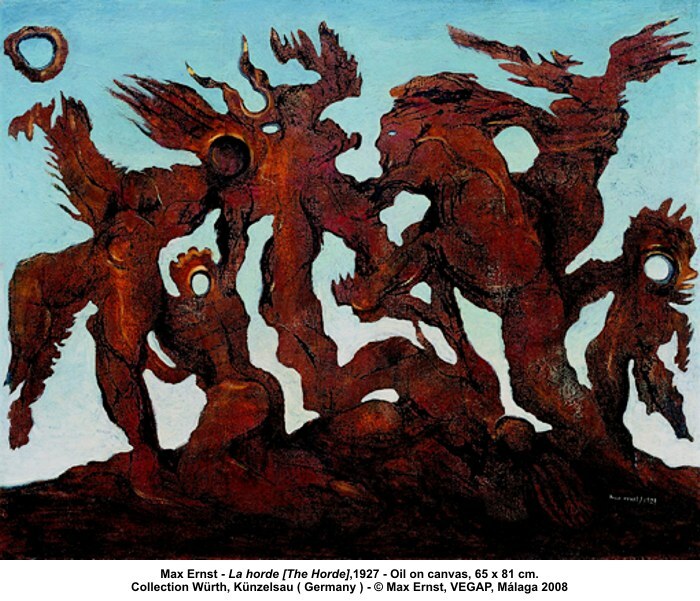 Hi, i love how you equate our current political with the piece by Max Ernst. It makes your argument that much more visceral and scary.